There is no picture as yet for Margaret Jackson. Married: 12 June 1838 at First Ballybay Church. *NOTE: The surname is sometimes spelled as BROWN - without the "E" in several of the records. The photo of Daniel Gunn BROWNE is courtesy of Christine WRIGHT of Gilford Castle. William R. BROWNE, born 9 January 1841, died age 21. John Jackson BROWNE, born 19 July 1843, died age 33. Elizabeth Sarah BROWNE Known as "Sarah" 6 February 1847, married James (Jemmie) Jackson. Daniel Francis BROWNE, born 28 July 1849, died age 18. My own introduction to the particulars of Daniel Gunn BROWNE were in an article by the Rev John MACMILLAN. His account of BROWNE’s life, written as it was in approximately 1930, has a tone which is a touch florid for the readers of today. It is, however, worth disregarding the tone for its contents. Fortinately, MCMILLAN's complete article was reprinted in the 1990 Journal of The Creggan Local History Society and is available by order from that group (on the internet). Accordingly, in 1796, William Brown settled as Congregational minister in Moy, Co. Tyrone, where his son was born on the 5th of January, 1808. The child had given to him in baptism the full name of his father's friend - "Daniel Gunn". I have highlighted the word Persia since with the lives in the next generation of Samuel GILMORE & Elizabeth BROWN (daughter of Thompson BROWN), make this earlier mention of Persia intriguing. Later in the article, a further link of interest occurs with respect to names which I have been tracking in our family tree presents itself. Apparently it was a Dr. Oliver EDGAR who was responsible for BROWNE’s education at “the school in Armagh”. Which school exactly, I don’t yet know. What we do know is that Daniel Gunn BROWNE matriculated at Belfast College in 1823 and with the view of entering the Presbyterian ministry. According to his biographer, he was a cut above the common lot right from the get go. “He pursued his collegiate studies with great devotion, distinguishing himself in every class, and gaining the respect of every professor. He was awarded prizes in Logic and Belles Lettres, Greek, Literary Criticism, Mental Science; for "distinguished manner of answering at examination for general certificate in the regular and extra course of Metaphysics, Philosophy and Polite Literature"; whilst, according to Professor Stevelly's certificate, he "all but obtained the Faculty medal in Moral Philosophy, Logic and Belles Lettres". Six years later, at age 21,In 1829, BROWNE set out for Edinburgh University, where he resided for two years and completed his theological curriculum. He there gained prizes in Rhetoric, "The Humanities" and for "a very ingenious and eloquent essay, which reflected great credit on his learning and taste". It is quite likely that this Reverend Richard DILL was the same as is in the lineage of the MOORHEAD branch of our family. The next bit of the tale shows the lighter side (or more frustrating side – depending upon your perspective) of being a rural minister in Ireland in the mid-1800s. On one occasion, he [BROWNE] started early in the morning on horseback, as he had arranged to preach on that day in Dundalk. The road was passed over very pleasantly as far as Forkhill, when, all of a sudden, the horse refused to go farther. An hour was spent in trying to humour him but he was not easy to be entreated. Some farmers going to chapel saw the minister's plight and, after their efforts to persuade had proved futile, a fresh horse was offered and saddled. He was mounted by the traveller, who reached his place of destination half an hour past the appointed time of service - followed all the way by his own unbridled steed in apparently penitent and apologetic mood. The congregation had left with the exception of one member, who immediately collected the necessary quorum of "the two or three" whose meeting together secures the presence of Another, when the service was solemnly conducted and greatly enjoyed by preacher and worshippers. The daughter of the gentleman who put so much trust in the preacher's faithfulness to his promise as to linger within the precincts of the sanctuary in confident expectation of his appearing, if at all in the land of the living, is now well known as a thinker and educationist both in this country and on the Continent. From the date of his retirement in active life in 1869, rendered necessary by heart disease, induced by his manifold labours, he became more than ever the loving and beloved head of his household, and to a very wide circle of relatives, ministers and acquaintances from far and near, the "guide, philosopher and friend". His memory remained with him to the end. At family worship he often repeated whole chapters. The Word of God was his mediation. A few days before his death, he remarked: "What a comfort that twenty-third psalm has been to me". He never murmured. Once he said, referring to the years of an old man; "Yet is their strength only labour and sorrow", but, on being reminded that the infirmities incidental to age will be laid aside, that old senses will be rejuvenated and new senses imparted, that we shall see as we are seen, know as we are known, and grow up into the stature of the perfect man in Christ Jesus after the power of an endless life, tears of joy ran down his cheeks and feelings of gratitude strove for utterance on his lips. The message came as he was surrounded by the members of his family, who had waited on him with touching devotion all through his declining years, and as one of his daughters was reading to him some of the promises of the Saviour, followed by his favourite hymn, "O God of Bethel", and the psalm he particularly loved. "Full Circle: A Story of Ballybay Presbyterians" David Nesbitt, 1999. Cahans Publications. The Manse, Clones Road, Ballybay, Co. Monaghan, Ireland. p. 70 23rd August 1842 the name of D G Brown - Newtonhamilton appears in the baptismal register concerning the ordination of James Crawford. Wm Breakey - Balladian & James McCullagh - Ballybay are both mentioned as elders. D G Gunn sermon explained Presbyterian ordination. 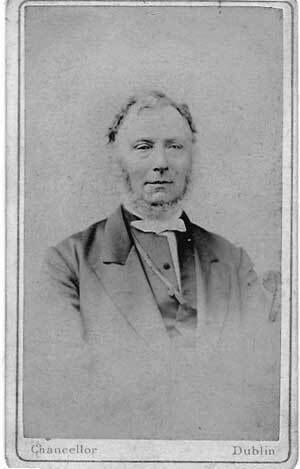 Afterwards, "the Presbytery was entertained at dinner by the congregation in the house of Mr. John Breakey. This John Breakey was probably John of Drumskelt. "At the Ford of the Birches", James H. & Peadar Murnane. Published by Murnane Brothers, Sept 1999.
p. 114 "Rev. D.G. Brown was the convener during the vacancy..." This would be 1853.